Taken From Skull of Palmist, It Interferes With Messages From Other World. Boston, Mass.-Spirit messages and the story of a search for the missing brain of John W. Fletcher, a palmist noted in London, New York, and Boston, who died under mysterious circumstances in the Hotel Pelham in this city on April 22, will be features of a contest over the will of Mr. Fletcher begun in the Middlesex county court at Cambridge. Mr. Fletcher died after the police had gone to his apartments to arrest him on a serious charge,which recent developments seem to show was unwarranted, and when questions were asked at police headquarters and by the medical examiner, Dr. George B. Magrath, the policemen who sought the palmist declared he had swallowed a pellet, which they believed contained poison and dropped on the floor unconscious. Dr. Magrath performed an autopsy and was unable to find any trace of poison, so he sent the internal organs to an expert for chemical analysis. 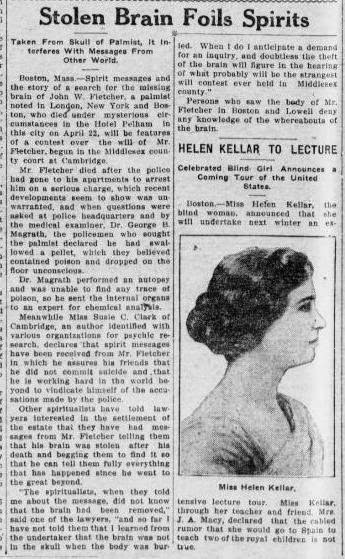 Meanwhile Miss Susie C. Clark of Cambridge, an author identified with various organizations for psychic research, declares that spirit messages have been received from Mr. Fletcher in which he assures his friends that he did not commit suicide and that he is working hard in the world beyond to vindicate himself of the accusations made by the police. Other spiritualists have told lawyers interested in the settlement of the estate that they have had messages from Mr. Fletcher telling them that his brain was stolen after his death and begging them to find it so that he can tell them fully everything that has happened since he went to the great beyond.